Eurydice’s options are a little like Sophie’s Choice; whichever path she takes will leave grief and devastation in its wake: stay with her beloved father or go with her beloved husband. In Sarah Ruhl’s smart, sassy take on the ancient myth, the young girl leaves her wedding reception for a drink of water and is lured away by the self-proclaimed Interesting Man, an evil seducer who promises that he has a letter from her long-dead father. Up in the demon’s penthouse apartment, after she finally succeeds in snatching the letter, Eurydice tries to flee and tumbles to her death. When she arrives in the Underworld and is dunked in the memory-erasing Lethe river, she reconnects with her dad — who painstakingly re-introduces her to words and language and literature. Meanwhile, up above, the heartbroken musician, Orpheus, vows to follow his new wife and bring her back. Using his sad, mournful songs (which make even the Underworld’s Three Stones weep), he manages to get past the gates of Hell. There, he meets the seducer, now a childish adolescent who says that if Orpheus starts walking up and doesn’t look back, Eurydice will follow and be his again. It doesn’t work out that way. Ove the past 2000 years, the myth of Orpheus has been retold and re-imagined innumerable times, but rarely as intriguingly as by Ruhl, who tells the tale from Eurydice’s perspective. Ruhl even shifts the blame for the outcome. There’s an inherent magic to her delightful and moving 2003 play, which provides a fertile playground for creative interpretation. Director Dhyana Dahl, interim artistic director of the Oceanside Theatre Company, has marshaled an array of artists to help her rise to the challenge. Composer Paul Durso created a pop-rock-Irish-sounding score, played live by a band of three: Durso on guitar and piano, Gabrielle Dodaro on violin, with percussion and sound effects (including a haunting use of Tibetan singing bowls) by Bryon Andersen, who’s also credited with sound design. There’s puppetry (by Mark Patricio and Kelsey McNeilly). 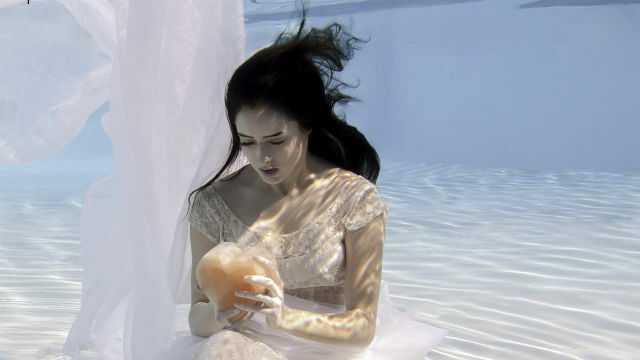 Photographer Skye Walker provided stunning underwater imagery for promotional materials. Visual artist Jason Adkins, whose huge paintings hang in the theater lobby, created an enormous 20-foot wide seascape to serve as backdrop for the wood platforms and stairs (he’s credited with the entire, bare-bones but evocative scenic design). Add to that eye-catching lighting by Paul Canaletti, costumes by Hannah Riffel and choreography by Shelby Caughron. It all adds up to a pretty elaborate undertaking for a small company. Not everything works (the shadow puppets are cute and clever, but they only appear sporadically and not always to maximal effect). Dahl has cast two attractive, appealing young actors for Orpheus and Eurydice: John Maltese and Morgan Taylor Altenhoff. She has the wide-eyed beauty of a true ingénue, and her expressive face registers a full range of emotions. Christopher Pittman brings a folksy country charm to the Father. And Tavis Baker has the perfect sleazy/puerile malevolence for the Interesting Man and Lord of the Underworld. The Three Stones, a kind of Greek chorus (9 year-old Catalina Zelles as Little Stone, compelling Madeleine Colburn as Big Stone and Brooke Farnum as Loud Stone), are aptly amusing. Any time you have an opportunity to see “Eurydice,” don’t miss it. This timeless but hip exploration of love, loss, language, memory, temptation and commitment offers a moving and unforgettable journey. Performances are Friday and Saturday at 7:30 p.m., Sunday at 2 p.m.